Vacation and travel videos are a fun way to share a quick take with friends and family—even while you’re still on the road. With iMovie for iOS on your iPad, you can quickly and easily cut your casual videos, spruce them up with themes, mix video with still photos, and add effects, music, and cool-looking titles. Here are a few simple steps that will get you from raw shoot to polished vacation video in short order. General interface for iMovie for iOS. As with most vacations, you and your companions are probably shooting photos and videos with a variety of different devices—iPhone, point-and-shoot camera, DSLR, or an iPad. There are several ways to organize this media on your iPad before getting down to your editing task. Having iCloud activated on your iOS devices is convenient because it will allow photos to appear immediately in your Photo Stream. If you brought your laptop along, you can sync your videos via iTunes. Use PhotoSync to easily transfer your photos and video from your computer, iPhone, iPad, iPod touch, and Dropbox. If you didn’t bring a computer on the trip, you can use the iPad Camera Connection Kit or SD Card Reader to import photos and videos onto your iPad from your camera. PhotoSync ($2), provides an easy way to wirelessly transfer photos and videos from your iPhone to your iPad. Once you have all your elements in place, you can turn your attention toward putting it all together. To begin editing, launch the iMovie app on your iPad, hit the Plus (+) button, and select New Project or New Trailer. If you wish, you can select a Theme under Project Settings (the gear icon at the upper right corner of the screen), and select Travel, and iMovie will add related music, loops, and transitions to your movie. 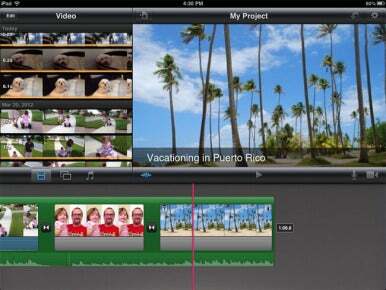 Even using iMovie's default theme graphics, you’ll wind up with a fun vacation video. To activate the precision editor, pinch vertically upwards on the transition point. If you want to edit without a theme, simply tap the filmstrip or photo symbol to import your media, or the camera icon to record fresh video right from the iPad. In the Video window, you can adjust the length of your clips by selecting and moving the orange handles on either side of the video. When you've trimmed to your satisfaction, tap the blue arrow to send it to the timeline. You can also shorten or lengthen clips in the timeline using the same method. 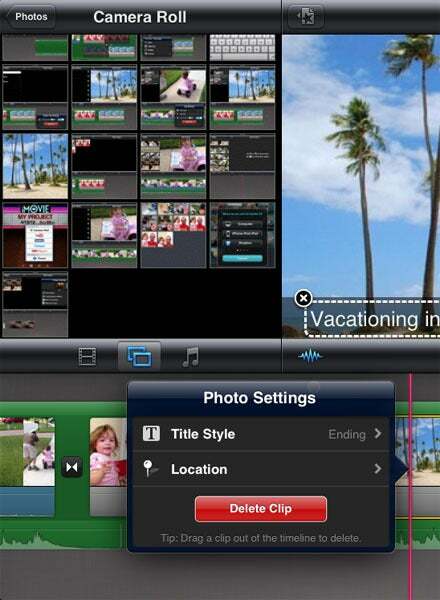 As you add both video clips and photos to your project, iMovie automatically adds a dissolve transition. 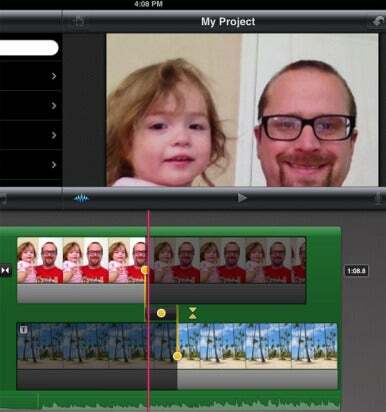 A precision editor built into iMovie for iOS makes it easy to accurately cut your video. To activate it, pinch vertically upwards on the transition point. That action launches the precision editor, which lets you finely adjust the handles to make your cut. Pinch vertically downwards to close the precision editor. It's easy to mix still photos with video. To integrate photos into your video, click on the picture icon below the video window. This lets you pull up your images from the Camera Roll, Photo Library, and Photo Stream. The default length for a still is four seconds, but you can make it longer or shorter by tapping on the photo, and adjusting the orange handles out or in. A Ken Burns Effect is automatically added to photos, but you can change the position and movement of the effect. First tap on the photo in the timeline, and then tap Start in the Project window and pinch the picture to zoom in, though you can't make the image smaller than its original size. Then, tap End, and move and zoom the image back out to where you want to finish the animation. Then click Done. Using themes easily adds music, but you can add your own music and sound effects by selecting the music icon and picking the audio you like. Once you’re satisfied with the video and photos on the timeline, you can add music, sound effects, and titles. Click on the music icon to open the audio options window. You can select Theme Music, Sound Effects, or the various playlists, albums, and more from your iTunes library. When you select a song or sound effect, it puts a green wrapper around your clip in the timeline. Double-tap the green clip to bring up the Audio Clip Settings, which allows you to adjust the volume up or down, or to delete the clip. Adding titles is similarly easy: double-tap on a video clip or photo to bring up the clip settings dialog box. Then select Title Style and choose Opening, Middle, or Ending titles. From there, simply type in the text in the project window and you’re set. To add text to your video, double-tap on a video clip or photo to pull up the settings, including Title Style. Once your video is done, you can easily share it. Go back to the marquee screen by tapping the My Projects button (the document icon in the project window). With your project selected, click on the right-arrow icon at the bottom of the window to pull up the Share Movie To menu. 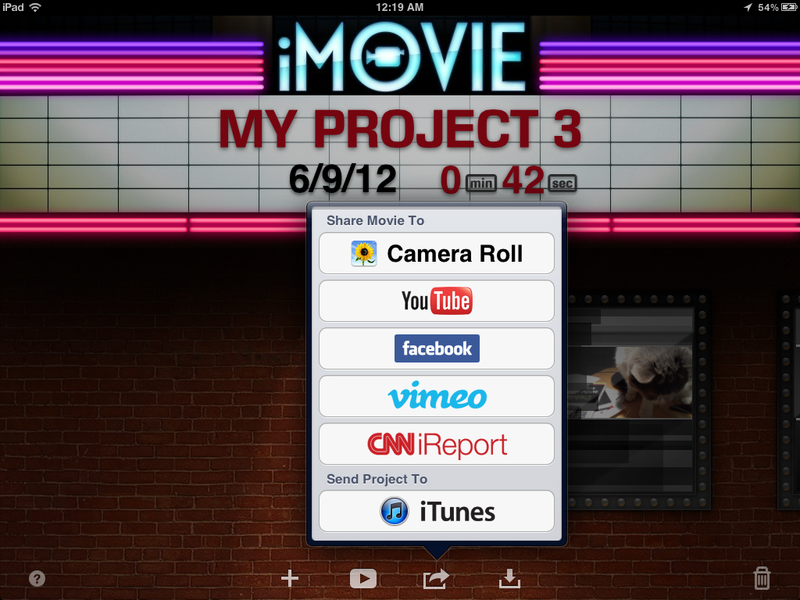 From here, you can send your vacation video to Facebook, YouTube, Vimeo, CNN iReport, or iTunes. Then, share a link with your friends and family before you get home. You can also save the video to your Camera Roll, to view it later. If you have an Apple TV, use AirPlay to view it in high definition on your big-screen TV. Once you're back on the marquee page, tap the Share button to send your video to YouTube, Facebook, family and friends, and more. Heath McKnight is a writer, filmmaker, video editor/cameraman, and instructor in West Palm Beach Florida.